Sometime in 1731, a struggling young would-be musician calling himself Vaussore de Villeneuve spent his last few pennies on a meager supper at an inn in rural Switzerland. The world would later know him by one of the greatest names of the 18th century: Jean-Jacques Rousseau. He glanced enviously over at the hearty meal being consumed nearby by another traveler, a man with an ample beard, furred cap and violet robe—an Orthodox monk or archimandrite. The priest, whose name was Athanasius Paulus, from the Ottoman city of Jerusalem, gestured to his neighbor to share his meal. They soon discovered that they could converse in a kind of corrupted Italian, the lingua franca in many parts of the Levant. Athanasius, who was traveling through the cantons of Switzerland raising funds for—depending on his audience—restoration of the Holy Sepulcher or the ransom of Christian captives, proposed that Villeneuve join him to help present his case more eloquently in French. Feckless, friendless and traveling under his pseudonym, Rousseau accepted. After a series of fundraising missions across Switzerland and in neighboring countries, the pair planned to travel on through Germany and Poland toward Jerusalem. If this young man, who would become known as one of the great minds of the Age of Enlightenment, had gone east with Athanasius, the history of European philosophy would not have been the same. Instead, Rousseau chose to follow a road toward Paris. There, seeing by chance an announcement of an essay competition at the Academy of Dijon, he was struck with a radical idea: the “arts and sciences” of which Europe was so proud, he decided, had brought more misery than progress to its people by alienating them from natural goodness. He decided to enter the competition. His controversial Discourse on the Arts and Sciences, signed with his real name, won him the academy’s prize. It signaled the start of a career that made him the most talked-about writer in late 18th-century Europe and a crucial figure of the intellectual crisis we call the Enlightenment. What can this tell us about the relationship of Islam to the European Enlightenment? Rousseau might seem a poor candidate for such a question. His great works were novels like La Nouvelle Héloise and Émile, his autobiographical Confessions, and groundbreaking political essays like his 1762 “On the Social Contract.” He never traveled outside of Western Europe, nor did he produce works that could pretend to any degree of Eastern scholarship. There are many other Enlightenment thinkers who might offer more favorable grounds for study of this question. For example, various French encyclopedists expatiated on the Muslim world, and other philosophers busied themselves translating the Qur’an or writing lives of the Prophet Muhammad. Yet Rousseau was closer to the Muslim world than many of these scholars: not just in his thought, but also in his life. “We have three principal religions in Europe,” he wrote. “One admits only of one revelation, another of two, and the third of three.” In this simple way, Rousseau broke down the differences among the major religions, insisting on their equal right to respect. Had he been born in Istanbul, he argued, he would have become a Muslim: To him, religion was in many ways an arbitrary result of geography. He argued for a tolerance that allowed individuals to make choices according to conscience while channeling their spirituality into civil society. Rousseau was not a proponent of the separation of church and state: He believed in a civic religion that could transcend sectarian divisions, and he admired the Prophet Muhammad’s ability to unite and lead his people. What Rousseau’s writings reveal is not a hostile encounter with an “Other” he saw as fundamentally different, but rather a whole set of observations that he drew from his personal experiences and those of his family, experiences across a world that was not so easily divided into separate Christian and Muslim spheres. This may tell us something rather different from the now-conventional view that Europeans looked out toward Muslim cultures through a screen of exotic stereotypes, which became known pejoratively as “Orientalism,” most famously through the 1978 study of that name by Edward Said. The reality is more complex. Just like Rousseau, many Europeans were migrants, refugees or travelers of one kind or another, crossing between worlds, in ﬂight and exile, in search of education, fortune or even the next meal. Rousseau’s life was never fixed or stable: Even at the height of his fame in 1762, he was forced to ﬂee France in the dead of night for fear of imprisonment or execution. He searched hopelessly for a degree of stability, never owning a house or furniture, dependent on the generosity of others and often too proud to accept it. 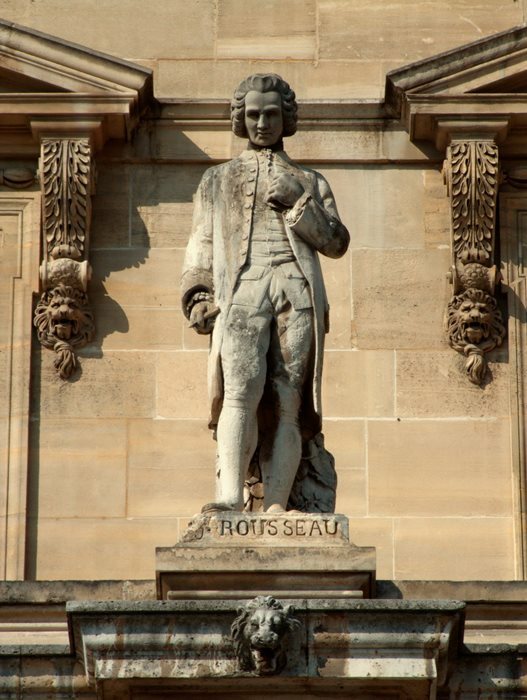 Even before his birth, Jean-Jacques Rousseau’s path was already marked by a world in motion. His father, Isaac Rousseau, from a refugee French Protestant family in Switzerland, married a young woman named Suzanne Bernard. Soon after the wedding, he left his pregnant wife and traveled to Istanbul, the capital of the Ottoman Empire, where he worked as a watchmaker to the Ottoman elite. Evidence suggests that such decisions were relatively common in the first decade of the 18th century. Markets were saturated at home, so Swiss artisans had to look outward to the world. The inscription at the bottom of this plaque, produced in 1912 in commemoration of the bicentenary of Rousseau’s birth, translates “Jean Jacques! Love your country”—and yet his father had found his career in Istanbul, and at age 15, Jean-Jacques ran away from home in Geneva to Italy. Isaac’s brother André went to Amsterdam; his uncle Jacob moved to London; and his brother-in-law Gabriel Bernard left for Venice, and then for Charlestown in the American colony of Carolina. His cousin Jacques, also a watchmaker, accompanied the embassy sent by the French government of Louis XIV to Persia and established himself permanently in Isfahan. Jacques’s son Jean-François Rousseau, raised speaking ﬂuent Turkish and Farsi and studying Arabic and Armenian, became the French consul at Basra. He was said to resemble Jean-Jacques so much that on his first visit to Paris some thought Jean-Jacques had returned from the grave, wearing magniﬁcent eastern robes. Istanbul, the most populous city in Europe—some 40 times the size of Geneva and even one and half times larger than Paris—was the wealthy and ﬂourishing capital of an empire that straddled Europe, Asia and Africa. Goods passed through the city from across the Ottoman Empire, Persia and India, and even as far as China and Japan. We know little of Isaac’s life there, but seven years is a long time to stay away from his family. Istanbul had just been restored deﬁnitively as the Ottoman capital, and the new Sultan, Ahmed III, would transform the city into a capital of leisure and consumption in what has been celebrated as the “Tulip Era.” In comparison to dour Geneva, this expanding, exciting city must have been a revelation. Yet Isaac Rousseau returned in 1711 to Geneva, to a seven-year-old son he did not know, and soon his wife was expecting Jean-Jacques, the “unhappy fruit,” as he later wrote, of that return. Like so many women of the era, Suzanne succumbed to the perils of childbirth. “I was born feeble and sickly,” Jean-Jacques wrote. “I cost my mother her life, and my birth was the ﬁrst of my misfortunes.” In Rousseau’s mind, his father’s decision to leave Istanbul was the cause of his mother’s death. His elder brother seems never to have recovered from this family trauma: in his teens he disappeared—perhaps also to the East—and was never heard from again. “All that we have not at our birth, and that we need when grown up, is given us by education. 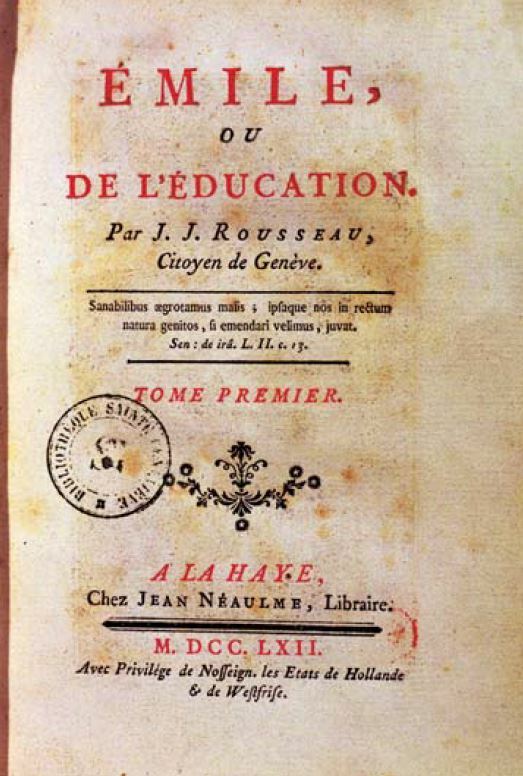 This education comes to us from nature itself, or from other men, or from circumstances,” Rousseau wrote in Émile, or On Education, published in 1762, in which his main character ultimately finds his deepest insights amid the social mobility of Algiers. “Vaussore.” This is how he found himself sharing a meal on the road with the archimandrite. It was during the pair’s sojourns in the Swiss town of Soleure that Rousseau-as-Villeneuve—who was also claiming falsely to be a Parisian—was summoned to meet the Marquis de Bonnac, former ambassador to Istanbul and now French ambassador in Switzerland. 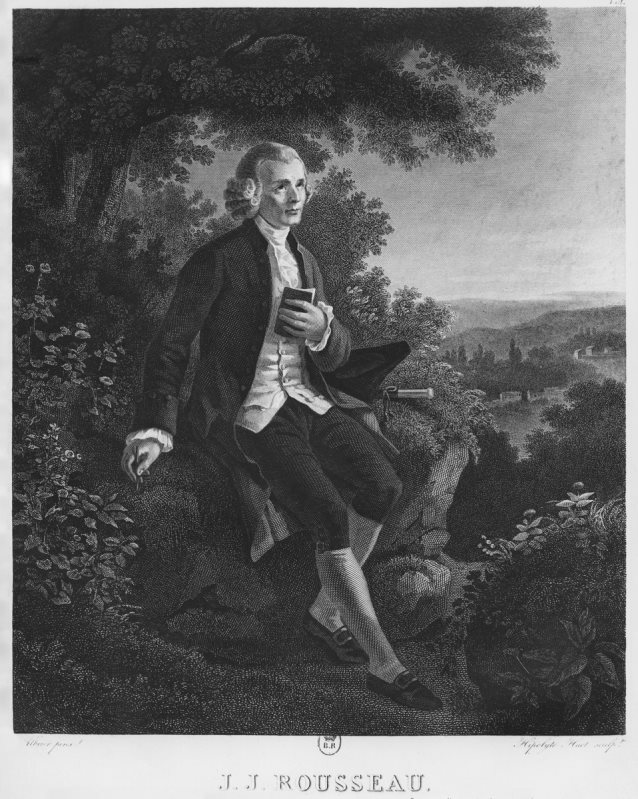 Rousseau poured out his story to this cultivated man, and then with even greater effect to the ambassador’s wife, ﬁnding for the ﬁrst time the kind of audience that would later respond so passionately to his remarkable Confessions, writings that seem modern even today in their bare-all honesty. “He must not be suffered to follow that Greek priest,” Madame de Bonnac declared. Soon Rousseau was on his way across the border into France, with assistance from the Bonnacs, and onward to Paris where he would ultimately find fame, if not fortune. Here the curious anecdote might have come to an end. We know that Jean-Jacques Rousseau did not travel to Jerusalem or anywhere in the Muslim world—at least physically. 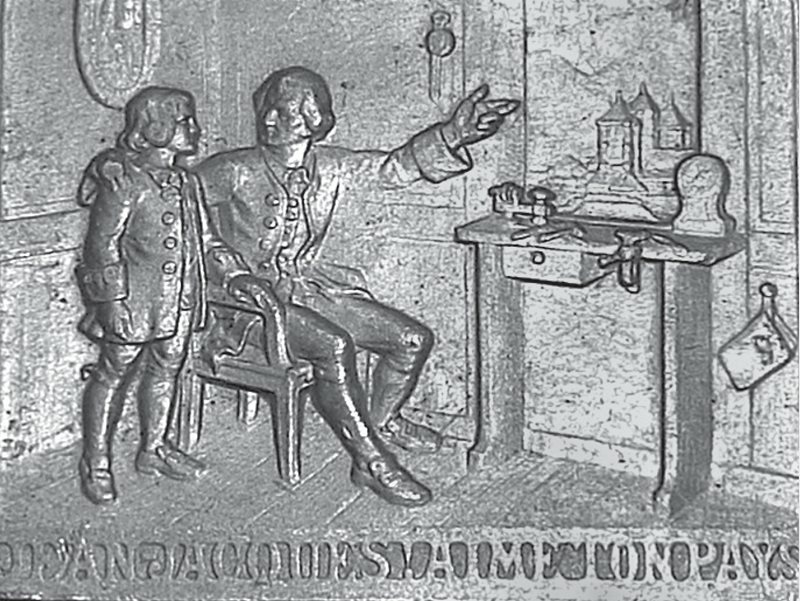 Only through the self-identiﬁed hero of his most famous novel, Émile, published to great controversy in 1762, did he complete the journey he had begun. Émile was an 18th-century best-seller and the educational foundation of the revolutionary era. It has been credited with inventing a new conception of childhood and criticized for its emphasis on separate spheres for men and women. It is one of the books that form the intellectual basis of contemporary Western civilization. Most editions, however, leave out the ﬁnal, uncompleted volume, entitled Émile and Sophie. Yet this volume is the most interesting of all: Émile leaves the European setting, and he ﬁnds the realization of his education in North Africa. 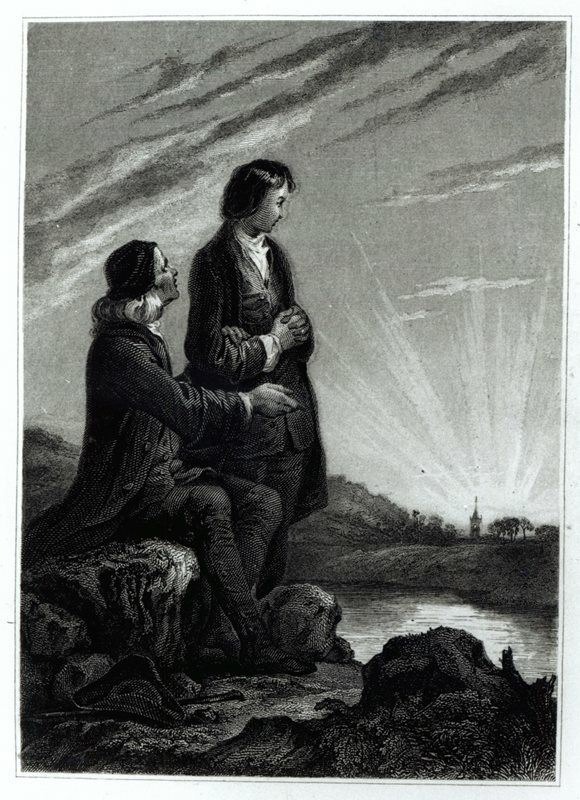 An engraving for an early 19th-century edition of the book serves as a visual metaphor for the larger European “Enlightenment” that Rousseau’s ideas helped drive. In the last (and incomplete) chapters, Rousseau has Émile, disgusted by society and the breakdown of his relationship with Sophie, leave France by ship. En route to Naples, the ship is seized by corsairs, and Émile is taken as a captive to Algiers. Laboring in a quarry under the lash of a foreman who whips his charges beyond their strength, Émile organizes his fellow slaves into a strike, showing the true meaning of his philosophical education through his resilience in the most extreme circumstances. The quarry’s owner calmly summons Émile to explain his actions. Émile is astonished: Any European master, he declares, would have had the strikers beaten or killed. “I found that the names of Moors and Pirates,” he declares, “carry with them certain prejudices against which I had not been sufﬁciently on guard. They are not inclined to pity, but they are just; and although one can expect neither gentleness nor clemency from them, one need fear neither caprice nor wickedness.” The idea of the “generous Turk” soon became a familiar one, used in theater and operas like Mozart’s Abduction from the Seraglio (1782). But here it was not accompanied by any of the romantic trappings of Orientalism. Rousseau rejected the exoticism of the “Arabian Nights”—pirates, harems and sultans—for a surprisingly rationalist conception of Algerian society. Rousseau’s tale indeed reﬂected recent events in Algiers, where a new dey, Muhammad ben Othman, had come to power in 1766 under circumstances similar to those described in the tale. Algiers was unusual in that its ruler was elected through the acclamation of the militia, just as Rousseau suggested. But Rousseau’s interest in Algiers lay more in the example it offered of the radical social mobility that he, like other European philosophers, considered to be an essential element of Eastern “despotic” societies. Aristocratic writers such as Montesquieu or Voltaire saw this as a ﬂaw, arguing that there was no freedom in a society where a slave could become a minister, or a minister punished with destitution or death, by the decision of the Sultan alone. They did not view the inequality inherent in their own society as a problem, but as a necessary element of society. Rousseau—son of a poor watchmaker, not a wealthy aristocrat—saw things very differently. “Why are Turks generally more humane, more hospitable than we are?” Rousseau asked in Émile. His answer was that in Ottoman lands even the greatest individuals knew they could ﬁnd themselves reduced to misery, whereas in France a noble could never ﬁnd himself in the place of a peasant, or vice-versa. Social mobility, Rousseau felt, drove an imaginative identiﬁcation of each individual with all other members of society, no matter how rich or poor. This new idea of a society shared by all, and not just by the rich and powerful, helped drive the French Revolution and the modern Western conception of social justice. If Rousseau only accomplished his journey to the Muslim world in a fictional guise, this was not his only experiment with cultural difference. When he was forced to ﬂee over the Swiss border after the publication of Émile—whose radical ideas on religion had proved too much for the French authorities to tolerate—he decided to adopt a new manner of dressing, forsaking the wig, breeches and waistcoat of court fashion for the long loose robe and round cap of Ottoman attire. He complained that bladder problems made a tight-ﬁtting garment unsuitable, but he could easily have adopted other, more conventional styles: the shepherd’s frock, the kilt, the toga or the priest’s soutane. 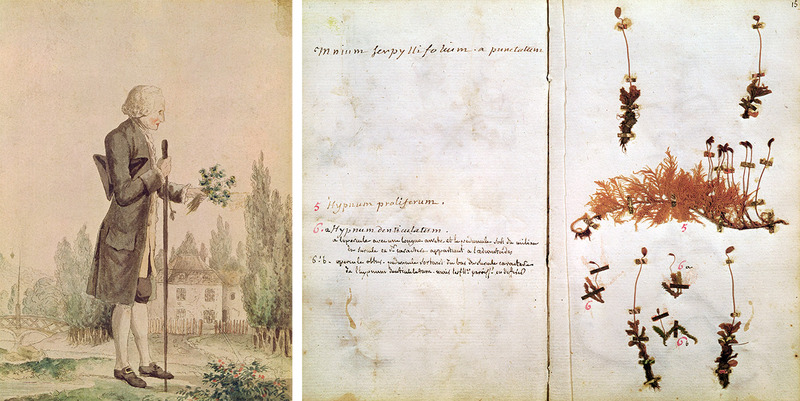 Late in his 66-year life, Rousseau cultivated an interest in botany, gathering and classifying herbs around Ermenonville, France, often collaborating with the noted pharmacist and botanist Fusée Aublet. Rousseau’s choice of Armenian dress was not caprice or exoticism, but a deliberate and meaningful act that conveyed much about his understanding of himself. In his Confessions, Rousseau reported the hostile reactions from the surrounding Swiss populace. I had a little Armenian wardrobe made for me, but the storm excited against me made me defer its use to better times, and it was only several months later that, when new attacks forced me once again to use catheters, I decided I might take up this new form of dress at Môtiers without risk.… So I donned the coat, the caftan, the fur cap, the belt, and having attended divine service in this outﬁt, I did not see any impropriety in wearing it to my Lord Marshall’s. The Marshall was well versed in the customs of Islamic cultures and the ways of religions beyond his own. His household was polyglot, including Ilbraham, a Buddhist Kalmuk Tartar; Mocha, an African of uncertain origins; and a young Turkish woman named Emetulla, rescued by the Lord Marshall’s brother at the bloody Russian siege of Ochakov, an Ottoman city in Ukraine. During these months in 1763 in Môtiers, Rousseau undertook the modern education of Emetulla, whom he described as his bonne soeur (dear sister). It seems that Emetulla played muse to Rousseau’s metamorphosis, teasing another guest prior to his ﬁrst appearance that “a man from my country has arrived, at least one dressed as an Armenian. You will dine with him. Guess who he is.” Another of his guests admired the “turban” Rousseau wore that made him appear like the hero of one of his own novels. These choices can show us the extent of Rousseau’s willingness to project himself imaginatively into different worlds, as he developed radically new ideas that shaped the course of modern history. For Rousseau, then, Islam and its associated cultures were no exotic “Other” against which his European identity was deﬁned, but an intimate element of his cultural repertoire. By experimenting with his connections to the Muslim world, Rousseau found ways to practice his social and cultural independence, exercising a form of principled choice that he saw as the foundation of political liberty. He pushed the geographical, cultural and even religious limits of identity, insisting on the individual’s capacity to choose different and original pathways across different worlds. Yet not all of these roads were so felicitous. Though he never traveled outside Europe, his family of emigrants and his encounters with polyglot travelers stimulated his empathetic imagination. “The world of reality has its limits; the world of imagination is infinite,” he wrote in Émile. By way of epilogue, we must return, sadly, to the archimandrite with whom we began. After leaving Rousseau, Athanasius continued his peripatetic journey back to Jerusalem, but three years later, his life took a very different turn. He arrived in Holland with a new compagnon de route called Jan Paus, carrying with him several letters of patent from European royalty and church ofﬁcials. When these letters were discovered to be forgeries, he was tried before the court of aldermen in Bosch, convicted of collecting money on false pretenses and hanged with the forged documents nailed above the gallows. Ultimately, then, Athanasius did not follow the path to Jerusalem any more than did young Vaussore de Villeneuve, the vagabond with a remarkable destiny whom he stumbled upon in his journey. Through a random act of generosity in offering a hungry young man a bite to eat, this otherwise unremarkable charlatan burst for a moment onto the stage of modern history. Rousseau’s wandering path was also signiﬁcant in shaping what we consider today to be the “West.” His intimate world was peopled by the in-betweens of that larger cultural space: his father, Isaac, regretting his return to Geneva while his relatives settled happily in Persia; the colorful household at Môtiers with the Turkish refugee Emetulla; the ill-fated, double-dealing archimandrite; the cosmopolitan Marshall in exile from Scotland; and even Rousseau’s alter egos— Vaussore, who was ready to tread the path to the East, and fictional Émile, who found the fullest realization of his rules of conduct as a slave in Algiers. These crisscrossing cultural paths through Europe and neighboring Islamic lands were woven into the writings and ideas that Rousseau never tried to separate from his life, and in this sense they speak today with insight and clarity to our contemporary world his thought helped to create. 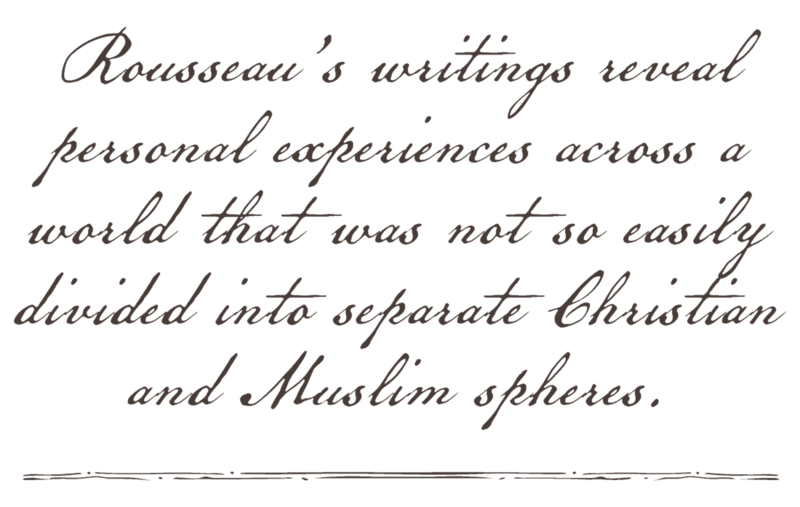 This article is adapted by the author from ”Rousseau’s Turban: Entangled Encounters of Europe and Islam in the Age of Enlightenment,” in Historical Reflections, vol. 40, no. 2, Summer 2014, ©Berghahn Journals. Ian Coller, Ph.D., is associate professor of history at the University of California, Irvine. Born in Australia, he previ-ously taught at the University of Melbourne and La Trobe University, Australia. His prizewinning book "Arab France: Islam and the Making of Modern Europe, 1798-1831" was published in 2011 by the University of California Press. He is currently working on a history of the French Revolution and Islam.